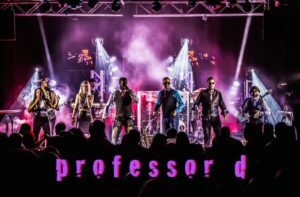 No other party band in the country puts more electricity in a room than Dallas’ Professor D. They are ten people with a single purpose – to make sure you and your guests leave stunned and amazed by the band you found. It starts out with great male and female vocals, continues with a soulful horn section, and finishes with a dazzling rhythm section. This phenomenal, interactive, fun band has a love for performing that shines through on every face.Not sure if this is the right band for you? With just a few pieces of information, we will send you a free, curated list of entertainment options for your event.